Muk in game: 410 Who? Important notice! Pokemon Muk is a fictional character of humans. 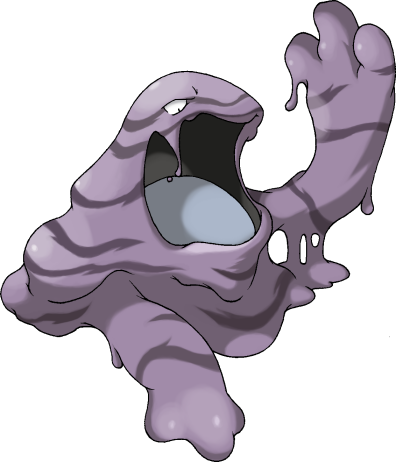 Muk is a large, sticky, amorphous Pokémon, made of living purple sludge. It has two small eyes with beady black pupils. It also has an enormous mouth with a grey tongue and strands of ooze connecting its top and bottom jaws. While it has no visible legs, it does have two arms with three fingers on each hand. However, it typically keeps one hand tucked in while it extends the other hand. It is a living biohazard, leaking toxins that instantly kill all plant life it touches. Even it being in close proximity to plants will cause them to wilt and die. Extreme caution is advised in avoiding any contact with this Pokémon, as an accidental brush up can lead to severe sickness. The effects of this Pokémon can leave the landscape barren for three years. In dirty residential areas where people throw trash into the streets, it is almost certain to appear. It will readily consume nearly any waste or refuse generated by people and Pokémon alike. It can be found in heavily polluted bodies of water, cities and factories. However, Muk's population has declined due to recent environmental improvements, leading some to believe that it will go extinct at some point. Alolan Muk has a more vibrant coloration, consisting of green, pink, yellow, and blue. The green, yellow, and pink colors are capable of shifting downwards while the blue stays in place. Like Alolan Grimer, it has various white crystals protruding from parts of its body, especially from its mouth and fingers, giving the impression of claws and teeth. It has blue pupils, black coloring behind its eyes, and a light blue tongue. Its vivid coloration is a result of the garbage it eats, which causes chemical changes in its body; these same chemical changes are thought to be the cause of its unending hunger. 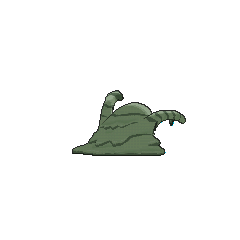 It's unexpectedly quiet and friendly, but if it is not fed trash for a while, its hunger will compel it to destroy its Trainer's furnishings for food. The crystals covering its body have a tendency to break off, which makes it extremely difficult to deal with due to the concentrated toxins contained within them. 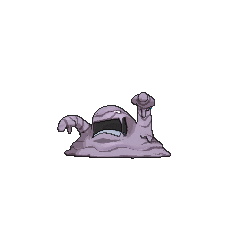 This variant of Muk does not produce the foul stench that the standard version is infamous for. Ash captured a Muk in Sparks Fly for Magnemite. It was transferred to Professor Oak's lab. Ash's Muk is always trying to smother Prof. Oak. The first time Ash used his Muk in battle was in The Fourth Round Rumble, as a trump card against a Bellsprout that had already defeated his Bulbasaur and Pikachu. A Muk appeared under the ownership of Attila during The Legend of Thunder!. Six Muk appeared in The Psyduck Stops Here!. 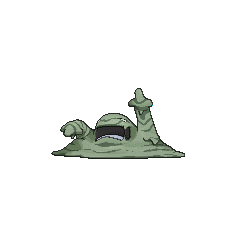 A Muk appeared in Secrets From Out of the Fog! under the ownership of a Team Plasma Grunt. Four Muk were among the Pokémon competing in the Fire and Rescue Grand Prix in The Fire-ing Squad!. A Muk was one of the sick Pokémon in a Pokémon Center in Carrying On!. A Muk appears in a flashback in The Joy of Water Pokémon as a former inhabitant of Lake Lucid before becoming the clean lake it is now. A Muk appeared in the opening of Destiny Deoxys. A Muk made a brief appearance under the ownership of a Trainer in the Lily of the Valley Conference in An Old Family Blend!. Multiple Alolan Muk debuted in SM013. EP030 Muk Ash's Pokédex Muk, Grimer's evolved form. Use extreme caution as its slimy form contains poison. 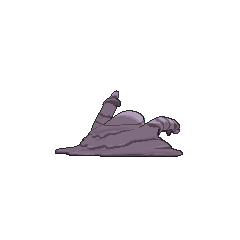 Muk is one of the Pokémon owned by Koga in ''Karate Machop!, where it was used on Cerise Island to battle the Elite Four, and proved useful in Koga's survival after the island began to crumble. In the HeartGold & SoulSilver chapter, it was used during the Circle Push event of the Pokéathlon. 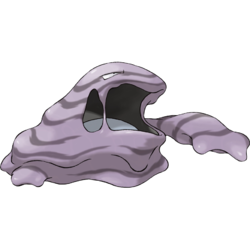 Muk has the highest average Performance of any fully-evolved Pokémon. It appears to be a pile of living sludge. Muk may also be based on the imagined fear that heavy pollution, caused by the leakage and/or improper disposal of toxic/radioactive waste, may result in the breed of new and undesirable life. Alolan Muk may be based on an oil slick, particularly the rainbow colors it produces when it mixes with water.